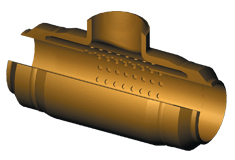 The Oil States Radial Flow Tee (RFT) is a specialized fitting that facilitates passage of pipeline pigs past tee connections where flow bypass often leaves pigs stranded, without restricting product flow. The RFT has an inner sleeve that directs the pig through the main line past the branch. Perforated holes in the sleeve and annular cavity provide a flow area at least equal to the flow area of the branch line, permitting full product flow through the tee during normal operation. Simple design to assure pig passage through a main line at a branch line intersection. Does not restrict flow in either the main or branch line . Designed to accommodate varying sizes and pressure ratings for both the main and branch lines. Standard weld ends or flanged upon request. ASME Section VIII Div 2 compliant to meet ASME 31.8 or ASME B31.4 and applicable sections of MSS SP-75, unless otherwise specified.